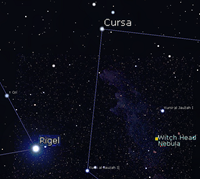 Continuing the tour of stellar objects crossing the meridian line this month: Cursa: the most northerly star of the River constellation Eridanus. 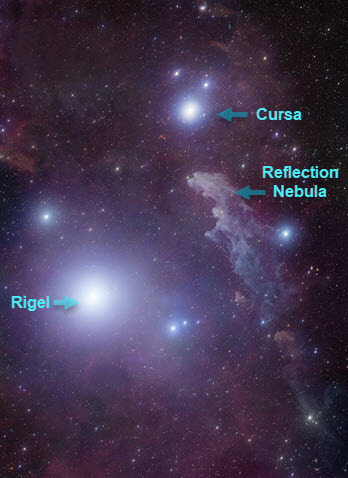 Look toward the familiar pattern of Orion and you may notice a reasonably conspicuous star upper right of Rigel, the bright star marking the hunter’s foot (his left); and naturally assume it to be a member star of the constellation being so close. Well, constellation borders can appear rather arbitrary sometimes and our star actually resides in one of the longest constellation in the heavens: Eridanus, 'the River. Beta Eridani' or to give its proper name Cursa. It is the second-brightest star in the constellation of Eridanus and almost the most northerly star in the river lying on the border with Orion. The traditional name Cursa is derived from the Arabic phrase Al Kursiyy al Jauzah, which means the Chair (or Footstool) of the Central One. ie Orion, formed by the stars Cursa, lambda (λ), and psi (ψ) Eridanus. With an apparent visual magnitude of 2.8, Cursa is by no means faint and can easily be distinguished by the naked eye from most locations. The star has a slight topaz yellow hue and is of spectral type of A3 III indicating that this is a giant star which has consumed the hydrogen at its core and evolved away from the main sequence. It is slightly variable in nature and is a fast spinner, with a projected rotational velocity of 196 km/s. Parallax measurements yield an estimated distance of about 90 light-years from Earth. The location and trajectory of this star suggest that it is a member of the Ursa Major supergroup, an association of stars that share a common origin and motion though space. However, its photometric properties indicate that it may instead be an interloper. 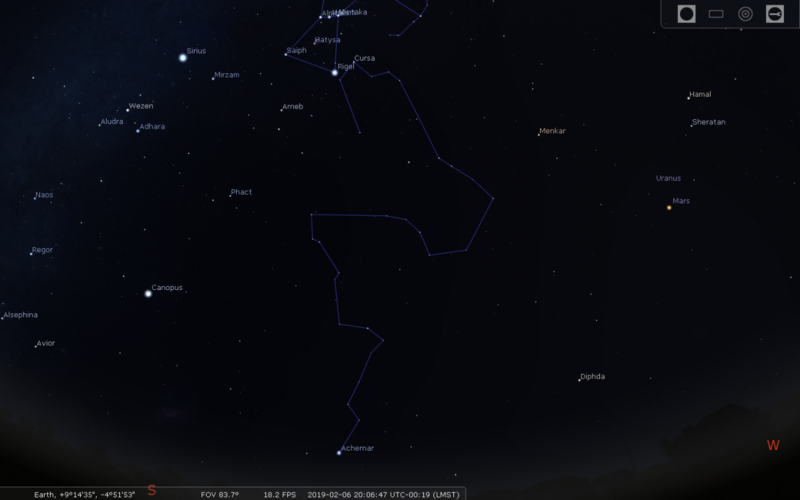 The constellation of Eridanus itself is said to represent the river Po in Italy which runs from north to south, although other sources named it as Potamos. Eratosthenes associated it with the river Nile, the only river to flow from south to north. In Greek mythology, the constellation is associated with the story of Phaëthon, the son of the Sun god Helios, who begged to drive his father’s chariot. Helios relented, but instead of staying on the beaten track, the chariot veered into the sky before falling back to earth scorching the lands, turning them to desert and turning skins dark. Zeus fired a thunderbolt at Phaëthon and the chariot to stop further mayhem and they fell into the river Eridanus. Eridanus is the 6th largest constellation by area, but is generally accepted as the longest, extending down from +3 degrees north to -57 degrees south, ending at the ninth brightest star visible in the entire sky; Achernar, Alpha Eridani, with an apparent magnitude of 0.45, it is also the hottest, bluest star amongst the top ten. 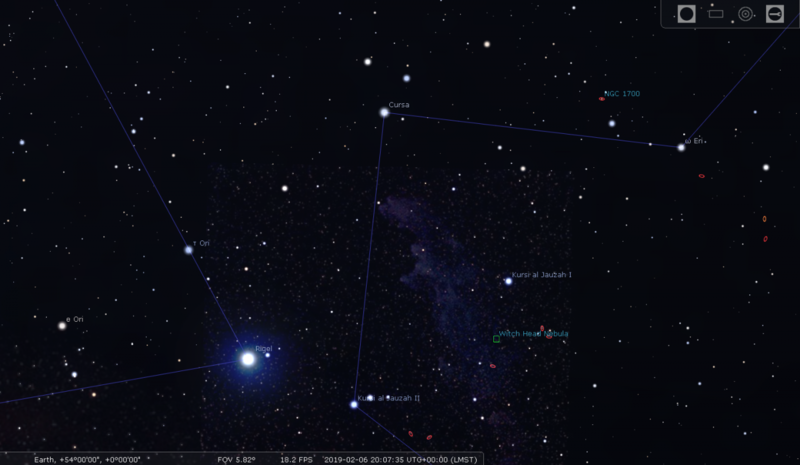 Interestingly Alpha Eridani, is one of the closet bright stars to the southern celestial pole. Cursa lies due south on the meridian at around 20:00h on Feb 6th. 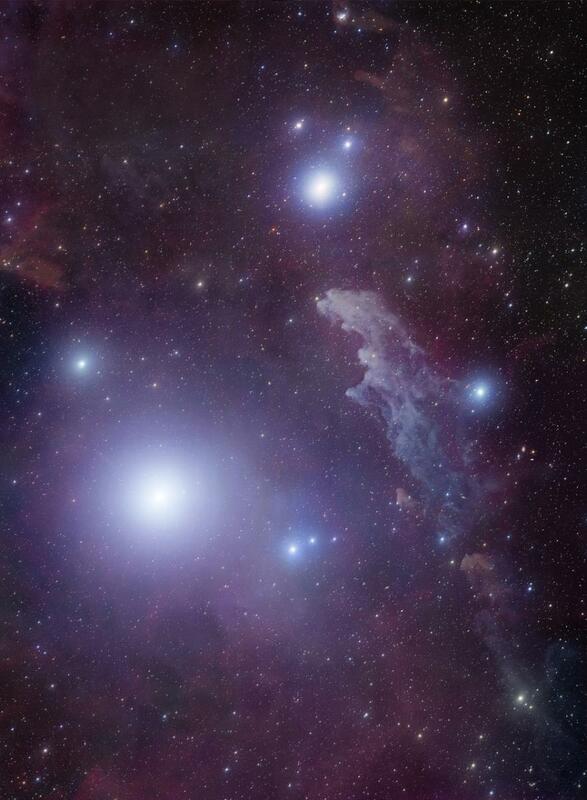 The Witches head nebula lies below the star, but only a timed, guided exposure of the area will reveal her ghostly image. So have a peek at Cursa, beta eridani, one end of the meandering river, but remember its mouth, marked by alpha or Achernar, lies near the southern pole.